I’ll be doing a reddit AMA tomorrow (Wed) at 11AM PT/2PM ET. 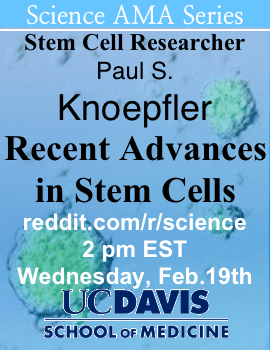 Ask me anything about stem cells! Stay tuned for the specific link. Stem cell quiz 2016: are you a stem cell guru? I’d like to know why it is taking Francis Collins so long to redefine what a stem cell is to accomodate Robert Lanza’s NED stem cell lines.A 30 day comment period(mostly positive) has been going on for more than 3 years now.If HESC’s are the Gold Standard,why would we want to use something inferior instead. The real crime here would be not using embryos and allowing them to be discarded instead. You really sum up my feelings on that one. I just can’t listen to anyone talking about “moral” or “ethical” issues with hESC’s anymore. I have seen babies being wheeled through a retinal specialist’s office because they were going blind, and the hESC RPE drug we should have had five years ago could have cured them. I have seen children going blind. Small children. There is nothing more disgusting, more immoral, more wrong, than allowing people to suffer when the cure is so close. Anyone know the link to this?